The amazing first season of this inspirational astronomy documentary by the History Channel has arrived on DVD thanks to Roadshow which collects all the episodes of the season into one impressive boxed product. Best of all, the series is quite down to Earth (pun intended) and the explanations are in laymen terms, ensuring that the common user will be able to easily understand this documentary series. Interesting, enlightening and entertaining are probably the best three words that sums up this series. As you can see from the episode listing, the episodes are quite diverse and for those with Foxtel in Australia, The Universe has moved onto Season Two that goes beyond the physical to the almost metaphysical with parallel universes and the like. At it’s heart, The Universe takes the viewer on an informative journey of what lies beyond our little blue planet from our neighboring planets, to our sun and even beyond our galaxy. Through expert interviews and some wonderfully impressive computer generated sequences, The Universe is reminiscent of the classic astronomy series called Cosmos, by the late and great Carl Sagan. From actual photos and various re-enactments, the topics in The Universe are very well presented and written and I found all the episodes extremely interesting and not boring at all. Even my partner who loathes documentaries found The Universe a truly riveting and informative experience. There are even some comical aspect to the series, however at the end of the day, you will be given all the current information about universe from the creation of the universe, the death of our sun and even alien life plus more. 14 episodes are featured in this collection. The high definition video only compliments the series and really draws you into to our amazing universe. Highlights for me, include the first episode, Secrets of the Sun which explains how our sun produces energy and the impact it has had on our planet from life to the devastating rays that shine down on us. It even moves onto the death of the sun (which is billions of years away) and what will happen to our star system. The Moon is another interesting episodes which gives the viewer a great history lesson on our closest neighbor and like the sun, it also effects Earth. It gives us a god understanding of how it has effected history from men worshiping it as a god and how travelers used it for navigation. Finally, Search for ET , another interesting episode that goes into some detail of whether life exists in the universe. This episode features Ray Kurzweil from SETI who helps explain the chances of life in the universe, thanks to SETA, a privately funded project called the Search for Extraterrestrial Intelligence. Of course, life may also be microprobes and other interesting creatures. In conclusion, The Universe is a highly professional documentary which at times only skimmers the service of knowledge, whereas other times it is even more in-depth. 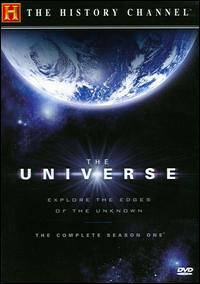 If you are a lover of documentaries or astronomy than this is the DVD for you... or if you are looking for something different, than I highly recommend you investigate season one of The Universe. It is a fireball in the sky, a bubbling, boiling, kinetic sphere of white hot plasma, exploding and erupting. Its size is almost unimaginable--one million Earths would fit within its boundaries. In this violence is born almost all the energy that makes existence on Earth possible, yet, its full mysteries are only now beginning to be understood. From Sun spots to solar eclipses, solar flares to solar storms, the birth of the sun to its potential death, discover the science and history behind this celestial object that makes life on Earth exist. Asteroids, comets, gamma ray bursts and the sun all combine to make the Earth a dangerous place to live. NASA's top brass and other scientists are arming themselves with the latest technology to pre-empt an apocalyptic attack. Watch and investigate bizarre, and terrifying apocalyptic scenarios and the ways that scientists are racing against the clock to develop technology to defend our planet. Jupiter poses many questions about our solar system. It is a powerful planet of gas whose flowing colors and spots are beautiful, but contain violent storms and jet streams. A mini solar system of over sixty moons rotate around Jupiter--a half billion miles from earth. Could one of these moons contain life under its icy crust? The moon has comforted man for thousands of years. It's been everything from a god to a compass, and the only cosmic body human beings have ever visited. NASA is planning to build a permanent outpost there. Discover how the moon came to be--if you don't already know, you will be astounded. Scorched by their proximity to the sun, Mercury and Venus are hostile worlds; one gouged with craters from cosmic collisions and the other a vortex of sulfur, carbon dioxide and acid rain. Prime examples of planets gone awry, do they serve as a warning for ominous scenarios that might someday threaten Earth? Cutting-edge computer graphics are used to show what life would be on other planets and to imagine what kind of life forms might evolve in alien atmospheres. Are the rings of Saturn a real celestial phenomenon or merely a cosmic Illusion? Technology allows the experts to get closer to the furthest planet visible to the naked eye. Old questions are answered and new ones arise. Does Saturn hold the key to Earth's weather and will one of its moons supply us with all the oil we'll ever need? Cutting-edge computer graphics are used to show what life would be like on other planets and to imagine what kinds of life forms might evolve in alien atmospheres. Ignited by the power of the atom, burning with light, heat and wrath, stars are anything but peaceful. They collide, devour each other, and explode in enormous supernovas--the biggest explosions in the Universe. Using cutting-edge computer graphics, never-before-seen satellite images, and interviews with the world's leading astronomers, take a front row seat to the most amazing light show in the cosmos. New discoveries regarding the Outer Planets are creating a fundamental rethinking of our solar system. Uranus is a toxic combination of hydrogen, helium and methane. Scientists speculate that the planet was knocked on its side after colliding with another body. Neptune's largest moon, Triton, is cold and barren, but some scientists speculate that liquid water might exist under Triton's icy surface. If this is proven true, Triton could be the home to one of the biggest discoveries of all time. Cold and inhospitable, Pluto completes one orbit around the solar system every 248 years. Cutting-edge computer graphics are used to bring the universe down to earth to show what life would be like on other planets, and to imagine what kind of life forms might evolve in alien atmospheres. Take a tour of the cosmic hot zones--black holes, galaxy mergers, gamma ray bursts and magnetars. Super massive black holes can figuratively "lasso" the Earth out of the solar system. A clash between two galaxies can result in a barbaric ritual called "galactic cannibalism" in which the dominant galaxy's super massive black hole eats the weaker one. Magnetars are a cosmic magnetic force so strong it could wipe out data on every credit card on the planet. In a galaxy filled with a billion stars, in a universe filled with a hundred billion galaxies--are we alone? SETI--the Search for Extraterrestrial Intelligence--is a privately funded project using radio telescopes and optical telescopes to scan the stars for signals. NASA is planning missions to Mars, Jupiter's sixth moon, Europa, and Saturn's largest moon, Titan, to look for primitive, microbial life in ice concentrations. Whether we discover primitive or intelligent life, how will that knowledge impact humankind's view of itself? Cutting-edge computer graphics are used to bring the universe down to earth to show what life would be like on other planets, and to imagine what kind of life forms might evolve in alien atmospheres. 14 - Beyond the Big Bang"